Hyderabad : Jamuna Kunta sits stiffly in a plush red chair at the Hyderabad press club, holding her head proudly erect as she quietly recounts the events leading to her husband’s suicide in Dubai. A farmer from Karimnagar, a rural district in Andhra Pradesh, her husband migrated to Dubai in 2007 to take a job as an unskilled labourer in order to pay off loans of about ₹ 2 lakh. A local sub-agent found a job for him—after charging a ₹ 1.2 lakh “logistical fee"—and assured him that his new job would allow him to send home at least ₹ 10,000 a month. Once he landed in the United Arab Emirates (UAE), however, his company seized his passport, and put him to work mixing cement, paying him a fraction of what he was promised: After working for 18 months, he was only able to send home ₹ 30,000. His calls home became less frequent. The debt collectors began calling more. Four other women sit next to her. 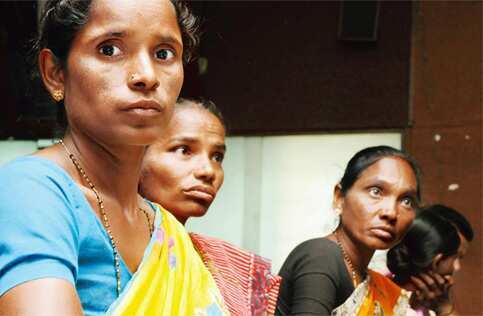 Each comes from the same district in Andhra Pradesh, and shares a similar story, having recently joined the growing ranks of “Gulf widows"—women married to migrants to West Asia who have died overseas. Legally, companies are supposed to compensate the families when workers die under contract. However, unable to navigate the bureaucratic process needed to get what is by law their due, many families don’t receive a rupee. Left with unpaid debt and children to take care of, many women find themselves trapped in an impossible situation. “My daughter has a blood disease and I have no money to pay the doctor," says Kunta. She and the other women have travelled more than 200km— the furthest from home she has ever been—to tell their stories to government officials in Hyderabad, hoping that someone might be able to help them. “I ask my neighbours for used clothes. I have no money for school or food. I do not know what to do. I look towards the skies for help," she adds. Vellulla is a sleepy town where clusters of white-washed buildings are set amid a patchwork quilt of small grassy farming plots and waving palms. Women walk down dusty lanes in brightly-coloured saris, infants balanced on their hips. Men are harder to find. At any given time, between 800 and 1,000 people, mostly men, of the village’s population of 9,000 are in West Asia, according to Sai Reddy, the local sarpanch (village council head). And in the past four years, there have been 15 deaths—most due to worksite and traffic accidents, heart attacks and stroke. Reddy, a slim man with long, spidery limbs, cups his hand over his face to shade his eyes from the sun, and points out a house with bleached white walls. “That man died in Muscat," he says. Reddy jerks his head in the direction of another lane a few hundred metres away and adds, “One from that house died in Saudi." The district, Karimnagar, has seen a spike in migration due to recent droughts, and along with two other districts, accounts for the bulk of Andhra’s migration to West Asia, according to the regional passport officer. Last year, the passport office in Hyderabad—the largest in the country—reported the highest number of passport applications recorded in Indian history (at least 450,000) and it expects an increase of 15-20% this year. The same three districts also appear to be responsible for the bulk of Andhra’s overseas suicide cases: Although reliable data on the total number of suicides is difficult to come by, available statistics indicate that the suicide rates among Indian semi-skilled labourers working in West Asia are significant. In Dubai, Indian migrant labourers accounted for 70% of all suicides in 2009, according to statistics provided by the mission abroad. Bharatiya Janata Party national secretary P. Muralidhar Rao claimed in April that more than 270 migrants to West Asia from Andhra Pradesh have committed suicide since 2008. A report by a Dubai-based non-governmental organization compiling the deaths of migrants from these three districts between July 2008 and November 2010 found suicide to be the third-leading cause of death. A dramatic spike in the number of suicides among Indians working in the UAE prompted K. V. Shamsudheen, a financial consultant and a non-resident Indian, to start a suicide hotline in 2006. Supported by sociologists, psychologists and counsellors, the hotline receives approximately 30 calls a day, he says. “The majority of the suicide cases are related to financial burden and depression related to debt," says Shamsudheen. “People go to better their lives only to find companies have changed the terms of their contracts. They feel trapped... they see suicide as a way to escape." This debt trap is often in place even before migrants set foot in West Asia: To find employment abroad, most migrants rely on local recruiters, borrowing heavily from family, neighbours and moneylenders to pay for the privilege of working overseas. Ankam Bhaskar is a clean-shaven man dressed fastidiously in a powder-blue button-up shirt, who has made his living as a sub-agent for nearly 25 years. He is one of approximately 20 sub-agents that report to a registered recruiter based out of Mumbai, and has another 20 sub-agents that report directly to him from local villages. Although the Emigration Act of 1983 legally prohibits agents from charging more than the equivalent of 45 days of the migrant’s wage—up to a maximum of ₹ 20,000—in practice, migrants pay recruiters significantly more, up-front and in cash. In Andhra Pradesh, the going rate for moving to West Asia ranges anywhere from ₹ 65,000 to ₹ 1.6 lakh, according to Bhaskar. In Punjab—where many migrants own land—agents often charge upwards of ₹ 7 lakh. Competition for labour contracts is fierce, and many registered agents bribe companies in order to secure them, according to Bhaskar. To recover the cost, agents pass their expenses down the line to the sub-agents working under them, who pass it onto their own sub-agents, each adding their own commission to fees ultimately paid by labourers. The debt trap intensifies when many migrants arrive at the worksite only to find that the terms of their contracts (often written in Arabic) have changed. Rakesh Kumar, a crane operator from Punjab, paid a recruiter ₹ 2.8 lakh to help him find a job in Libya in October 2009. When he arrived, he discovered that the company he thought he was going to work for did not exist, and the firm that had actually sponsored his visa would pay him a mere 200 dinars ( ₹ 7,220 today) a month, 300 dinars fewer than what he had been promised. A soft-spoken man with round, almost child-like features, his brown eyes harden as he recounts how the company confiscated his documents—including his passport, job letter, and contract—before he’d even left the airport. “They took everything. I had no proof that I was working there legally," he says. Kumar reached his breaking point when he learnt that the only food served would be bread and meat: A devout vegetarian Hindu, he had specified his dietary preference in the original contract. Rather than violate his religion, he subsisted only on bread and water for one month. It was only after he and 15 of his friends staged a strike that the company finally agreed to buy them tickets home. Five others from Rajasthan—all in significant debt after paying hefty recruiter fees—continue to work for the company “not because it was good", he says, but because “they couldn’t afford to go back". Such tactics are frequently used by less scrupulous companies to maintain control over their employees, according to inspector general of police for the Crime Investigations Department in Hyderabad, S. Umapathi. “Some intentionally keep passports until the visas expire, because it makes (workers) easier to exploit," he says. Employers’ power is further strengthened by the “Kafala system", prevalent in many West Asian countries, which ties migrant workers’ visas to their employers, enabling them to keep workers from changing jobs or leaving the country. Adding to the work stress, workers also struggle with feelings of profound loneliness and isolation, according to Shamsudheen, and face nearly unrelenting pressure from families back home to send more money. “There’s a shift that takes place when someone moves overseas," he says. “Families expect a higher standard of living and spend lavishly—to them the bread winner is like a machine." In contrast, Shamsudheen says, many of the workers themselves live in tightly packed rooms with poor ventilation, working 12-hour days (even when sick), and six-day work weeks, and subsist on little more than dal and roti. “People become desperate. These men require moral and emotional support," he says. “People call me and say, ‘I feel trapped. I am in deep trouble. I am always thinking on how I can escape,’ and for me that means suicide." For the women who are left behind, the loss of their spouse is merely the first of many new hurdles to overcome. Muddam Laxmi has been waiting for more than one year for her husband’s body to be granted an exit visa from Saudi Arabia. She sits with red-rimmed eyes on the cement floor outside the brick home she shares with her eight-year-old son, surrounded by brown piles of curled beedi leaves that she rolls—her primary source of income since her husband died. Her neighbours say that she has cried nearly every day since learning of her husband’s death. Her husband migrated to Saudi Arabia in 2004 on a tourist visa to find work as an unskilled labourer. Last May, he died of a sunstroke. Laxmi found out about his death from a family friend, and has been trying to recover her husband’s body ever since. According to Nisha Varia, a senior researcher with Human Rights Watch who focuses on migrant labour in West Asia, many families experience long delays in recovering bodies of their loved ones. Varia names Saudi Arabia as the worst offender, where the bureaucratic process of granting a body an “exit-visa" requires more than 13 different documents in Urdu and English, and can take from several months to more than a year. In 2009, India’s ministry of overseas Indian affairs recorded 1,729 complaints “pertaining to the delay of dispatch of the dead bodies of Indian workmen, or delay in getting the compensation and other dues from foreign employers" from Saudi Arabia alone. In cases when the body belongs to a person whose visa has expired, it is sometimes never returned. In January, concerns over long delays in recovering bodies prompted the ministry of overseas Indian affairs to announce that they would set up a special cell dedicated to the purpose of bringing back the bodies of those who have died abroad. In 2010, the ministry brought back 1,500 bodies—among the most it had done in recent years, according to the ministry. For Laxmi, the inability to receive her husband’s body means more than a lack of closure—it has rendered her a pariah in her own village: According to local customs, she cannot participate in local festivals or ceremonies, nor even enter a neighbour’s home until her husband’s body has been cremated. She spends her days in isolation, waking up early to make her son breakfast, and then rolling beedi leaves alone on her front porch. Women from the village sometimes come to keep her company, but do not generally stay for very long—until her husband is cremated, she is considered “untouchable". She is in dire financial straits: the ₹ 1,000 she makes rolling beedis is barely enough to survive on, and completely insufficient to pay off the ₹ 4 lakh debt she inherited from her husband. She begs neighbours for hand-me-downs, has pulled her son out of school, and is contemplating selling her home, built from a subsidy given to beedi workers. “I am not living like a person," Laxmi says, eyes downcast as she picks apart a dry beedi leaf, sprinkling bits of it onto the ground. “I am like a ghost." This is the second in a three-part series on illegal immigration and the problems faced by legal immigrant workers from India told through the stories of three people.